Anyone who has tried to build a piece of furniture from scratch knows the frustration of painstakingly cutting pieces of wood, only to discover that they won’t fit together because the cutting was not quite accurate enough. That’s exactly what happened to Alec Rivers, a PhD student in the Computer Science and Artificial Intelligence Laboratory (CSAIL) at MIT, when he attempted to build a simple picture frame using woodworking equipment he had inherited from his grandfather. Despite measuring and aligning his tools as best he could by hand, Rivers found that he could not produce shapes with enough precision to make them all fit together. “I was getting incredibly frustrated, because just as with any home project I would cut things out and they would look about right, but none of the pieces would line up,” Rivers says. But rather than simply throwing the pieces of wood into the trash and settling for a store-bought picture frame, Rivers decided there had to be a better way. So he and colleagues Fredo Durand, an associate professor at CSAIL, and Ilan Moyer, a graduate student in the Department of Mechanical Engineering, began developing a new kind of woodworking router — a drill-like cutting tool — that could automatically cut out accurate shapes from a piece of material by following a digital design. 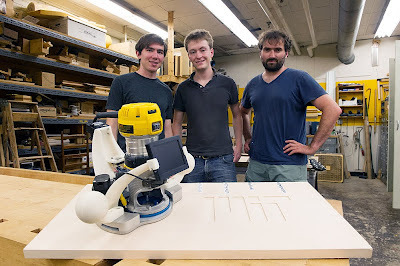 The result is a handheld device that can adjust its position to precisely follow a digital plan when the user moves the router roughly around the shape to be cut. The team will present its device this week at the Siggraph conference in Los Angeles. For the device to follow the design, it must know exactly where it is on the sheet of material at all times. So before beginning to cut, the user first moves the device over the raw material, while an on-board camera films the surface and then stitches together all the video frames it sees into a single cohesive 2-D map of the piece. To ensure that the system can locate itself even when the material has no distinctive pattern or markings, the user simply places stickers containing a black and white contrast pattern on the sheet to be cut. Once the design is loaded onto the map, the user can line up the device on the piece of material and begin cutting; the system will then automatically compare all the new images it receives from its camera with the digital map, to determine exactly where it is relative to the plan. Motors controlled by the system adjust the position of the drill to ensure that it precisely follows the plan. The router can accurately cut out even complex shapes, such as a map of the United States, Rivers says. In contrast, relying on the user for the general positioning means the handheld device can theoretically cut out any sized shape. Indeed, the MIT researchers are even investigating the possibility of installing a similar system on a vehicle, such as a forklift truck, attached to a flame cutter. That would allow it to precisely cut out very large shapes, such as the huge pieces of steel used in military shipbuilding. The system could also be attached to electric scissors to accurately cut out shapes from fabrics, or to a print head, to quickly and easily draw pictures on large spaces, such as walls.